Previously invisible on China’s economic map, hidden at the back of the classroom, a few emerging cities of the YDR (Yangtze Delta Region) are drawing more and more attention as the high-speed train network develops fast throughout the region. More senior cities such as Suzhou and Wuxi, who have been doing well for a number of years, are somehow victim of their success and becoming more and more expensive. They keep their attractiveness thanks to their proximity with Shanghai and their elevated quality, but now the attention is gradually shifting towards other cities which were not as developed a decade ago, but whose prodigious step forward make them now an attractive place for foreign investment in the region. These cities are strongly supporting China’s growth and will keep developing at an above-average pace for a long time. Nantong and Xuzhou (Jiangsu province) and Hefei (Anhui province) are three of these cities that lately enjoyed a considerable jump in popularity. It is secret to no one that cities are competing against each other to attract the most promising, stable and secure companies to invest on their lands. This competition is beneficial to investors who then get a higher quality of services, help and support from the local authorities, sometimes with subsidies, guarantees of land for future expansion or tax incentives. Local governments massively invest into developing modern facilities, roads, bridges, energy alimentation systems, etc. This paired with the financial competitiveness of these regions which still enjoy lower costs than cities closer to Shanghai make them little Eldorado for Chinese or foreign investors who want to settle or expand their business in China. And finally, life conditions are becoming agreeable there. By building modern residences, international schools and sophisticated hospitals, they try to reach the same life quality standards as in major cities, and this might be achieved before long. Moving there no longer means “going to the countryside” for skilled potential workers. The proximity with Shanghai and its surroundings stays reasonable. Recruiting and retaining decent workforce becomes less of a hassle. At the heart of Anhui, central China’s fastest growing province, Hefei is just 3 hours away from Shanghai and 4 from Beijing by high-speed train. Its proximity with major export bases in the YDR and its growth make it highly appealing to investors and Hefei attracted USD 2.85 billion of FDI in 2012, 8.9% more than in 2011. According to The economist1, Hefei was in 2012 the world's No.1 fastest growing metropolitan economy, with 12.1% growth in 2012. In April 2013, the Consulate General of Switzerland in Shanghai and the SwissCham jointly organized an economic mission to Anhui province, and particularly to the city of Hefei. The delegation visited Hefei Economic and Technological Development Zone (HETDZ) and Hefei High-Tech Industry Development Zone (HIDZ), the two most important industrial parks of Hefei. They were particularly impressed by the size and modernity of these parks. The Swiss companies visited on the spot (ABB and Bühler) also seemed very satisfied and already planning for future expansion in the region. The latter mentioned the satisfying availability of qualified people in Hefei, a source of constant worries in many provinces. Talking about quality, the delegation’s last visit was to the University of Science and Technology of China (USTC), one of China’s top universities and pride of Hefei’s education who boasts over 50 institutions of higher learning and more than 200 scientific research institutions. Apart from that, the Swiss economic mission also received a warm welcome by the local authorities: they could meet with Hefei Vice-Mayor Mr. Zhang Qingjun on their first day and with Vice Governor of Anhui province Ms. Hua Jianhui on the second day. Both expressed their enthusiasm for Swiss investments in the region and their hopes for further implementations of Swiss companies in their province. One hour drive north of Shanghai over the Sutong Bridge spanning the Yangtze Delta, the city Nantong remained rather isolated from Shanghai until the recent completion of two bridges over the Yangtze River. The newly established connectivity makes it “heart of the greater Shanghai region”. Moreover, the high-speed train line linking Nantong and Shanghai will be ready in less than 5 years, connecting the two cities in 25 minutes. Known as the home to education and sports, Nantong’s educational institutions are also renowned in China, giving it a human resources advantage over her competitors and labor costs remain lower than most of the YDR (52’000 RMB of average annual salary in Shanghai against 40’000 RMB in Nantong 2 ). With its consequent efforts, Nantong succeeded in attracting large foreign investments and can already set higher criteria for potential investors. At the occasion of some company openings and groundbreaking ceremonies, a small delegation of the General Consulate traveled to Nantong twice over the summer. As the city is not yet connected to Shanghai by high-speed train, expectations were not set too high but this made the revelation even bigger. The first glimpse revealed a massive investment of the local authorities into infrastructures: large roads, modern bridges, clean canals, bright new facilities, hotels popping out here and there, etc. It did not stop here: the historical center was set anew and high-standing residences, schools and hospitals were built to make of Nantong an enjoyable city to live in. A visit through the Nantong Economic & Technological Development Area (NETDA) showed that the local government set high standards of quality and security for the companies settling down in their development zone. Their support to current and new investors as well as their inclination at arranging interesting incentives left a very positive impression. Major city in Jiangsu history, hometown of the first emperor of the Han Dynasty (Liu Bang, 256-195BC), housing rich historic treasures, Xuzhou is the largest city in northern part of Jiangsu Province. Perfectly situated between Shanghai and Beijing (both can be reached in 2.5 hours), the city has a population of nearly 10 million and a total area of 11,259 km². In 2012, Xuzhou assumed a GDP of 402 billion and a growth of 13.2%, boasting the fastest growth rate in Jiangsu Province for three consecutive years. With a strong industrial base, Xuzhou is already the largest construction machinery research and production base in China and the world largest Solar Polysilicon Research and Production Base. In December 2013, a Swiss delegation gathered by the Swiss Consulate and SwissCham Shanghai visited Xuzhou city. The Xuzhou government stressed the focuses of Xuzhou’s development strategies: further development and renovation of the city infrastructure, to improve ecological environment by increasing the forest coverage. During discussions with the two main economic zones, the Xuzhou Development Zone and Xuzhou High-tech Zone, the local industry expressed a very open attitude to work together with the Swiss companies, not only in the traditional industries, but also in the field of biomedical technology, IT, safety industry, fine machinery, etc. They would like to widen the cooperation not only to foreign investment but also to joint R&D projects. China University of Mining and Technology, a high-level university located in Xuzhou, showed great interest to have contact to Swiss universities and establish collaboration with the Swiss industrial and academic partners. 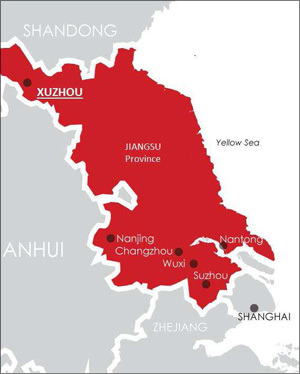 After having visited these economic zones and major enterprises like XCMG and Nhwa pharmaceutical company, the delegation concluded that the main advantages of Xuzhou are the relatively low labor cost in comparison with the rest of the Yangtze Delta Region, its situation and its accessibility to make Xuzhou an important hub. Due to the implanted industries and its long tradition in the construction machinery, Xuzhou can provide high-level technical expertise in this field and experienced technical human resources as its specialized schools and university from many young specialized workers. But these cities are not unique cases. There is a big potential in the provinces surrounding Shanghai, and the development of the high-speed rail network will surely influence the future of many cities. Once neglected, they now see international companies fighting over a piece of their land. The attention is slowly shifting towards the hinterland. Once Nantong and Hefei become as expensive as Shanghai today, it will be the turn of other cities, even further from Shanghai but more attractive in terms of costs. These cities are one of the combustibles allowing China to maintain its pace and stay on the road of growth. Whereas some analysts highlight the slowdown of the Chinese machine, the growth still is robust, and a multitude of cities like Xuzhou and Hefei are here to keep alimenting it.